Continuing on from past fried chicken sandwich disasters I didn't necessarily want to just leave some of those places on the hook for one bad item. Even though a couple were really bad. I did make the effort to try other dishes and also have a return visit or two. One of those spots was Hardwood Bar and Smokery where the fried chicken sliders were just a tad on the dry side. Okay, more than a tad but the slaw was decent! The chicken isn't really their main draw since smokery is in their name, smoked meats is supposed to be more their game. And beer, of course. Like the Allagash White Ale above, something I've had other places and like with it's citrus notes and not too harsh actual beer taste. Yeah, one of those, like some beer but don't like it to taste too much like beer. This one seemed a good light compliment for some heavy barbecue like eating. The menu is divided into bar snacks, shareables (which seems the same) and sides. You can also turn the shareables into a platter with a $6 upcharge that includes two sides. Seemed like a good idea for me and Ms. O who was along for the ride since we are both totes into ribs and meat. 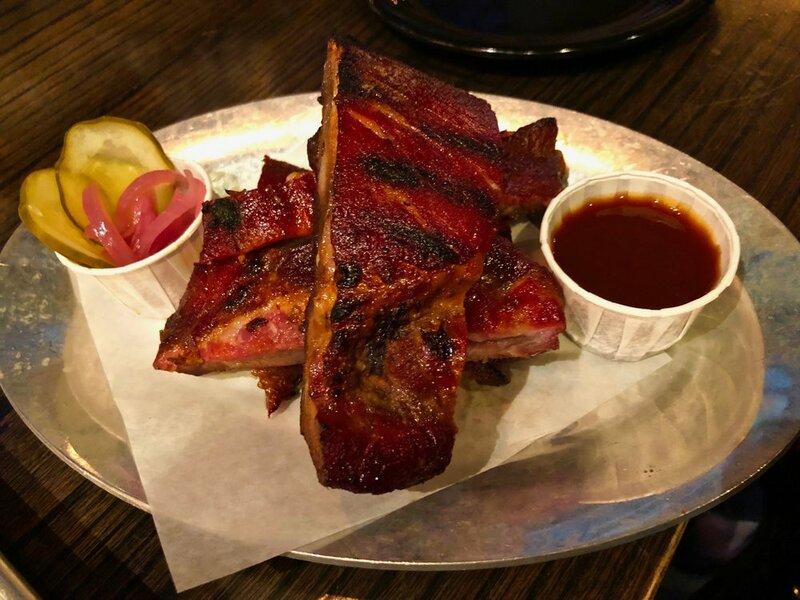 Yes we jumped right on the smoked pork ribs which are served up in 1/4 a rack for $15 which seemed kind of a lot for that size serving and after it arrived, I still maintain the cost to size ratio was high. At least they didn't slather it in sauce but put it on the side and it had a lovely little spicy tang to it which was fortunate as the meat wasn't exactly fall off the bone. The smoke on it was as just the right level to make it interesting but the meat itself was not as juicy or tender as we were hoping for. It is not like it was dry and tough but somewhere in-between. Actually, leaning more toward the I need a knife with this side. Definitely not the best ribs me or Ms. O have had in this town and as frequent readers know--we've had LOTS! If there is a pig cooking somewhere, we will find it. Who knows, maybe because we were there late in the day they were what was left? Either way, not exactly ribs I can recommend between the price and taste, there are better options around town. The first side dish we had was not all that better either. 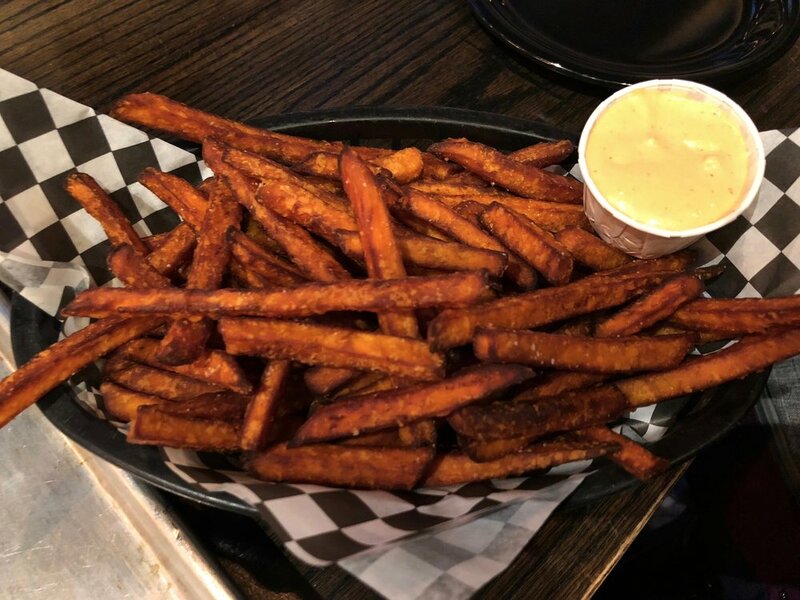 As you can see from the pic, the sweet potato fries were on the overcooked side with a number of them tasting burnt. While some folks might like them that way, we did not. And whatever that dip stuff was, just not. It could not overcome the over done fries. Fortunately, these weren't the only things we got. 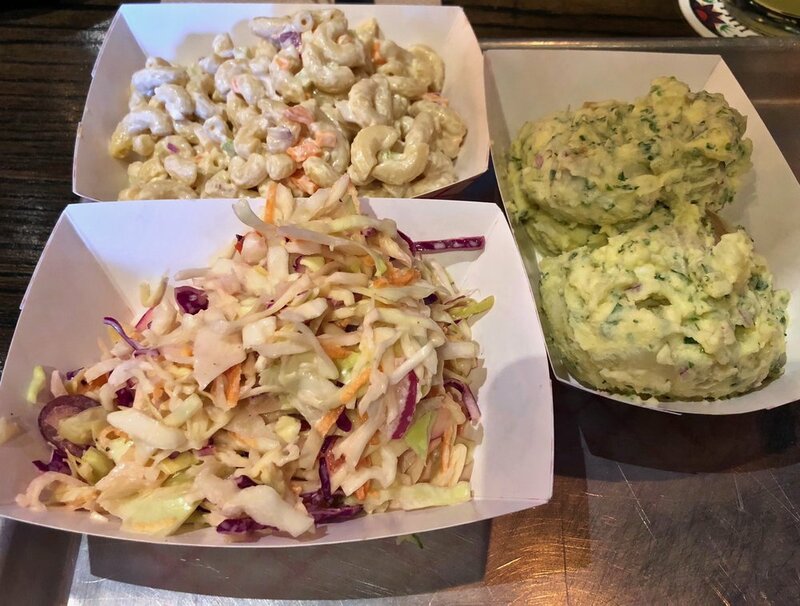 The whole two sides with shareables allowed us to chow down on some cole slaw, potato salad and macaroni salad. A whole bunch of carbo loading going on above, not to mention some mayo! Surprisingly, I did like these. The slaw was the right combo of touch of mayo and vinegar in a mix of two kinds of cabbage and carrots. Very old school with tang and little sweet. Not quite grandmas but a good compliment to the bbq sauce. The mac salad had chunks of carrots and celery and here all the mayo is perfect for this down picnic side dish. It needed a little pepper but we both enjoyed it. The potato salad was mostly chunks of potato, a little mayo, some red onion, green onion and a lot of dill which I was totally down for. This might not be to everyones taste but it was mine. Plus, the portions on these are more than enough for two people to get their fill. While it isn't usually my norm, I also went back to Hardwood for another visit around lunch time as I was intrigued enough to try one of their other smoked meats. This time it was the brisket which I ordered up in sandwich form. And at lunch you get a choice of one side with for $16 so I opted for the curly fries. I was hesitant about the price but tried to keep and open mind and this time I was pleasantly surprised when the sandwich came out. It was definitely piled high with multiple slices of brisket, pickled red onion and a bbq sauce meets mayo spread on a toasted bun. I will say there was a good 1/4 pound of meat here and this is some serious two handed sandwich eating. The meat this time was super tender and juicy with some crispy edges full of smoke. This was a real winner. The sweet pickled onions add some balance to all the smoky meat though they were a bit skimpy on the bbq aioli spread. Not to fret, there are bottles of the tangy bbq sauce around if you want to kick up the flavor. But if you are a fan of brisket, you will probably want to enjoy it as is. I do think they could try a different bun as the "pub bun" they use doesn't hold up well with all the juicy meat and gets pretty squishy about halfway through. A minor quibble I guess but I say the same things about burger buns that don't stand up so why not mention it here too. The curly fries came out hot and crispy and I guess the only downside is you don't get more than you see above. I guess I shouldn't be a glutton about it, but that is what I do and who doesn't want more curly fries! They came with a dip which was somewhere between ranch and tartar sauce. Weird as it sounds, I kind of like it. But just with the fries, didn't work so well with the meat. Hit or miss? Absolutely. And they are both extremes. When things are good, like the brisket sandwich, they are sublimely supreme. When they are bad, like the fried chicken sandwich or pork ribs, they are truly forgettable. But in this instance I can look past the bad and just focus on all the good I had here. The Allagash White Ale, the macaroni salad, the potato salad and the still brings up tasty memories brisket. These alone are enough for me to say Hardwood Bar and Smokery is worth a beer and brisket visit for either lunch or after work. Along with a side of mac salad or curly fries too.